It was the week before Easter, early to mid afternoon, and I was at Target with Kari and Tory, hanging out while they picked up something. On the way out, we were drawn into the Easter candy aisle. I decided I wanted to buy one thing, but was having trouble choosing what candy to get. 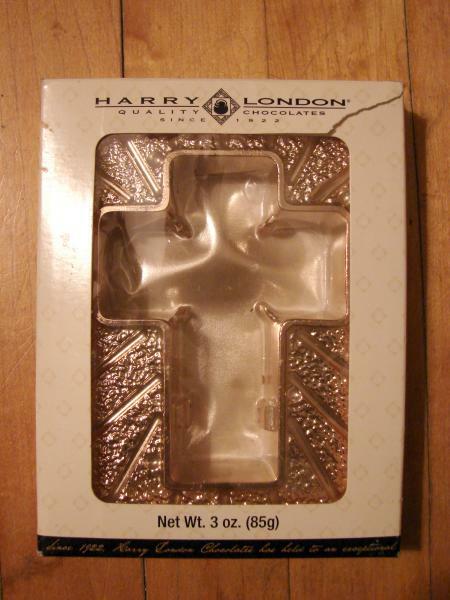 There were chocolate crosses for sale, which I thought was extremely bizarre – either taken as a religious icon or as a torture & execution device, a cross just wasn’t the kind of thing I expected to see cast in chocolate. But there they were – two versions – one with pink flowers and one with purple. I picked up the purple-flowered version and showed it to Tory. In fact, in the end of several minutes in the candy aisle, I was unable to choose what to buy – and actually left Target empty handed. That will probably only sound bizarre to those who know me, and know that I have a savage sugar tooth – it was odd that I’d committed to buying some candy, and then failed to do so. Upon entering the house she told me that she had brought something for me. It was a chocolate crucifix with purple flowers. And better, it turned out that she’d bought the cross from the very same Target that I’d been at earlier, – it was almost certainly the very same one that I’d picked up and put back on the shelf a few hours before. Am trying to catch up on these previous posts, so far some really interesting stuff. I think this kind of detail is important, in that you feel you committed to buying the candy but at the same time decided you shouldn’t. What caused that disconnect between decision and action? There must have been an exchange of information there, I think, either to or from your subconscious or the collective unconscious or whatever you want to call it. Did you happen to find out if your friend had bought the chocolate cross at Target before or after you’d picked it up and put it back? Just noticed I never responded to your comment – she bought it after I had been there, about two hours later.